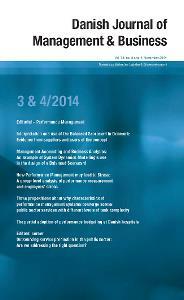 Special issue of Danish Journal of Management & Business: Performance Mangement, 2014. Vol 78, No. 3-4. Edited by Per Nikolaj Bukh & Jan Mourtisen. Performance is an ambiguous concept. In the introduction we take the lack of clear definitions as an invitation to explore what is meant by performance, how performance can be perceived and how we can understand managerial activities related to performance. The papers in the issue consider performance management at an organisational level and address new developments and thinking in relation to performance management. Read more about balanced scorecard and strategy maps as well as knowledge management and intellectual capital reporting.